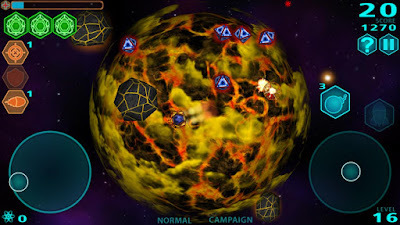 If you love space adventure then Astro Bang HD for Android is the game for you. Fly your very own spaceship in and around various planets in the fast paced 3D adventure. That's right, you do it all in 3D! Of course not everyone wants you to enjoy your fight. There are plenty of enemies to rid yourself of, and you have your choice of ways to do it. Use guns, bombs, and even missiles to put bad guys in their place and rack up the points. For doing a great job, you get the warm and fuzzy feeling of a job well done. While that is nice, most of us want more, right? Of course! Collect upgrades, tokens, and bonuses through the achievements as well as climb the leaderboards (powered by Swarm) as your score shoots up. Not only is it all in 3D, but you have 18 levels to work your way through. This is not your run of the mill, fly by the night kind of space adventure. Astro Bang HD will keep you entertained and challenged from here to the proverbial "kingdom come." All you have to do is download and you are ready for space wars wherever you may be. Whether at home, at work, or trying to make your better half happy at the ballet or a monster truck show, you can be sure boredom will not be in the mix. The future is now! Download Astro Bang HD from Google Play!